Note - this file is in black & white, but it's still rather large, due to the number of illustrations and high page count. The file is nearly 12 MB. Most Internet Service Providers have a 20 to 25 MB maximum download capability. As of this writing, The following have the 25 MB limit: AOL; AT&T; Comcast; Gmail; and Yahoo! Mail. CenturyLink; CenturyTel; and Embarqmail have 20 MB limits. There are still providers that are less, including Cable One and Hotmail, both of which have 10MB limits. If we are unable to send the attachment automatically by email, we may manually upload the files-to-be-attached to DropBox and include a download link in your email. If you do not have a Dropbox account, you can immediately obtain one at no charge. After downloading the file, click on "File" in the Adobe Acrobat menu bar at the top of the screen, then click on "Save As," and save to a location on your hard drive or other storage device. After wondering for several years why American researchers know very little about German census records, my good friend, Dr. Roger Minert, found an opportunity to live in Europe for six months to investigate them. He was sure that many existed, but he could find very little information about them. While in Europe, he learned that even German researchers know very little about their census records! How could such a potentially important resource be lost to obscurity? In a new book, written in English, researchers can now learn where and when German census records were compiled, as well as why and how. The author also describes state by state the content of census records and explains how surviving census documents can be located. This is groundbreaking information, of enormous value to anyone researching their German roots. Would you like additional information about your family in old country? The information found in the parish registers is key to your research, but there's often even more family information to find in the German census records. This book is also available in a softbound edition. Click on this link to be directed to that page at the FPRC website. This book is also available as a PDF eBook, as well as a softbound edition. The eBook is immediately downloadable, while the book ships by the USPS. Click on this link to be directed to that page at the FPRC website. This book is also available in a hardbound edition. Click on this link to be directed to that page at the FPRC website. 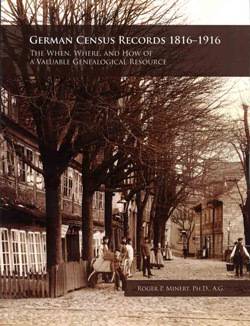 Chapter 43: German Census Records from 1816-1916: What Do We Know Now?